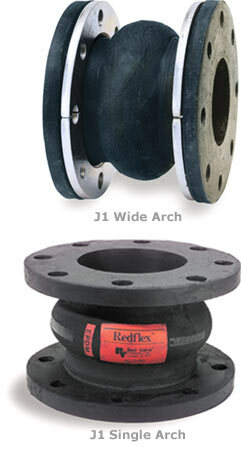 The Redflex® Expansion Joint is used to compensate for pipeline movement and vibration. The construction of a Redflex® joint is very much like a heavy-duty truck tire: layers of high-quality elastomers are reinforced with steel wires and synthetic fabrics. Redflex® Expansion Joints features full-face integral flanges that eliminate the need for additional gaskets when installing the joint. The flanges are drilled to mate with ANSI 125/150 flanges, with special drilling available upon request. Galvanized or stainless steel retaining rings can be provided to protect the flange and distribute forces evenly. Redflex® Joints can also be manufactured to meet Coast Guard and Military standards as well.